The Eastern Surfing Association (ESA) hits the beaches of Cape Hatteras this week for their Easterns – Best of the East – Grand Finals surfing championship September 19-25th. This annual event on Hatteras Island is four decades strong. How do surfers get to compete at the Easterns? Each year the ESA has over 150 competitions along the entire East Coast. Top finishers from the local District levels are invited to advance to one of the three Region competitions. Then the top finishers in those championship events are invited to the The Easterns. Held each September on Hatteras Island, the Easterns are the official surfing championship of the East Coast. In town this week? Don’t miss the ERGO ESA Easterns Party hosted by REAL Watersports. This will be an outdoor event hosted at REAL on their waterfront deck. Bring your family, there will be plenty of surfers of all ages representing the best of the best from all over the East Coast. There will also be plenty of celebrity appearances including shaping legend Pat Rawson who is flying in from Hawaii for the party! • OPEN to the Public! The Eastern Surfing Association is the largest amateur surfing association in the world, with a current membership of approximately 9,700 surfers. It was founded in 1967, by East Coast surfers to promote, preserve and protect the sport of surfing on the East Coast. Our family oriented programs promote a healthy and active lifestyle. It is not uncommon to find two or three generations of the same family involved as members of the ESA, and actively competing in our program. Two of the original ESA founders, Cecil Lear and David Reese, are still active in the association today! The ESA’s activities are organized into a total of twenty-six districts, which extend along nearly 2,000 miles of coastline. Stretching from Maine through the Gulf Coast of Florida, Alabama and the Great Lakes across the Atlantic to the Caribbean, each district’s programs are developed and operated by a dedicated group of volunteer directors and staff. 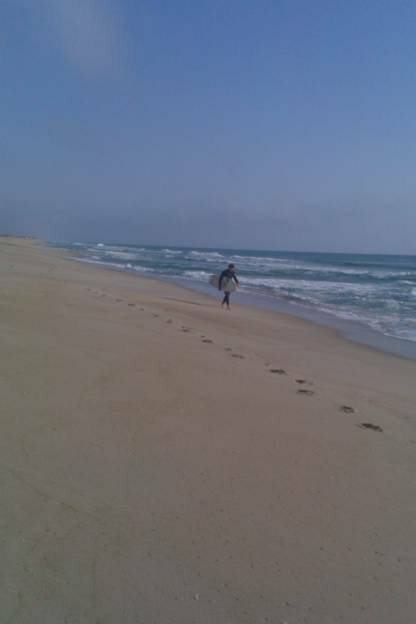 Come and enjoy surfing on Hatteras Island. Photo by Shiralee Timmons of Surf or Sound Realty. Last week Hurricane Bill brought some challenging waves for surfers to enjoy. Photo by Lisa Brooks-Hill of Surf or Sound Realty.